The earliest mentions of Korea are almost always found in books about China. The list of such books is huge, a major online resource, Bibliotheca Sinica, lists over 3,000 titles with links to online texts / facsimiles. 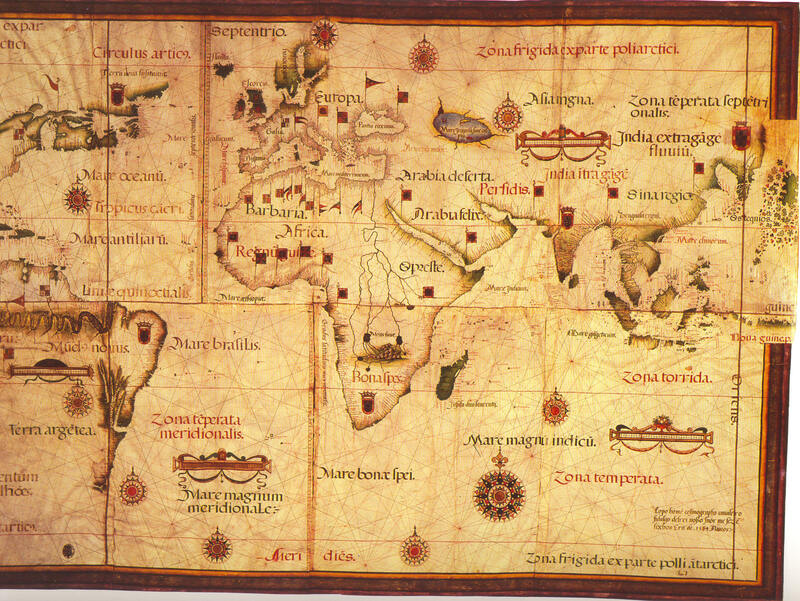 There is an extensive treatment of the early cartographers in a published paper by Henny Savenije. All the books referred to in these pages are listed in an online bibliography. A very much abbreviated English version, that lacks almost all the mentions of Francis Xavier and the Jesuits, appeared in the mid-17th century: The voyages and adventures, of Fernand Mendez Pinto, a Portugal: during his travels for the space of one and twenty years in the kingdons of Ethiopia, China, Tartaria, Cauchinchina, Calaminham, Siam, Pegu, Japan and a great part of the East-Indiaes. With a Relation and Description of most of the Places thereof; their Religion, Laws, Riches, Customs, and Government in time of Peace and War. Where he five times suffered Shipwrack, was sixteen times sold, and thirteen times made a Slave. Written Originally by himself in the Portugal Tongue, and Dedicated to the Majesty of Philip King of Spain. Done into English by H C. [Henry Cogan] Gent. London, Printed by F. Macock, for Henry Cripps, and Lodowick Lloyd , and are to be sold at their shop in Popes head Alley neer Lumbar Street. 1653 see Internet Archive version or National Library of Portugal). Click here for the text of two extracts from this version, the first about the introduction of the arquebus. In the years that followed, Portugal and Spain competed for the right to preach and trade in the Far East, counting on the Pope to make the final decision. By 1600 Spain had also acquired trading and mission rights in Japan, but the Dutch and English were not far behind. The Portuguese and Spanish viewed them as pirates and treated the crew of any ships they captured with great harshness. The Jesuits in Japan sent back reports and letters regularly. These were then published and translated and they contain the first references in passing to Korea, especially once the Imjin invasion began. Because of the deep conflicts and rivalries, religious, commercial and military, between the Catholic nations of Spain and Portugal and the Protestant lands including England and the Netherlands, the development of knowledge about and then contacts with the Far East in England mainly came thanks to two remarkable Dutchmen. Dirck Gerritsz Pomp (also known simply as Dirck Gerritsz or Dirck China) (1544–1608), was born in the town of Enkhuizen, then went to Lisbon in 1555, to learn Portuguese and train as a merchant. 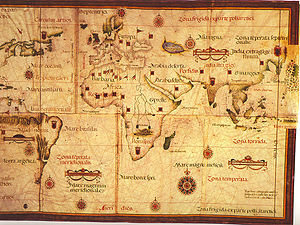 In 1568 Dirk established himself as a merchant in Goa. He sailed to China and Japan at least twice, arriving in Japan on July 31, 1585 for his second visit there, on the Santa Cruz (which belonged to the German bankers the Fuggers and Welsers). He returned to Goa on the same ship, on his way back to the Netherlands. In Goa Jan Huygen van Linschoten (1563-1611) boarded the ship, having learned that the Archbishop had died during a journey back to Portugal. He seems to have learned in detail about Gerritsz's journey to Japan during the long voyage back to Europe (it forms the 36th chapter of Part 3 of his Itinerario after having first been published in 1595 in his Reys-gheschrift). It may well be that the information about Korea in the Itinerario (see below) also came from Gerritsz. While Jan Huyghen was obliged to remain in the Azores for two years dealing with business involving a lost or damaged cargo of pepper, Gerritsz returned to Enkhuizen in April 1590. He composed an account of trade with China which was published in 1592 in Lucas Janszoon Waghenaer's Thresoor der Zeevaert ('Treasure of navigation'). In the summer of 1598 he joined a five ship Dutch expedition under admiral Jacques Mahu that was to either buy spices in the East Indies or head for China and Japan to load up with silver and silks etc. Mahu died during the voyage and Pomp received command of the Blijde Boodschap. Another of the five ships was the Liefde (see below). Short of supplies, the Blijde Boodschapentered the port of Valparaíso in November 1599 and was captured by the Spanish. Five years later, in 1604, Pomp was freed. He went aboard a ship belonging to the Dutch East-India Company in 1606 and disappeared from history, presumably dying during the voyage home. Jan Huyghen van Linschoten also seems to have originated from the town of Enkhuizen, certainly he returned there after his time in Asia. The honorific title 'van Linschoten' is one he seems to have given himself in Goa, to improve his social standing. He had no connection with Linschoten and it is not known why he chose it. He left the Netherlands in 1580 to join his half-brothers in Seville. After spending some time in Portugal, one of his half-brothers got him a position as secretary to the newly appointed Archbishop of Goa, João Vicente da Fonseca. He and the Archbishop left Portugal on April 8, 1583. He spent about five years in Goa as Secretary to the Archbishop and during that time he avidly collected information, and made copies of many secret maps and roteiros / portolans (navigation charts) and acquired other sensitive commercial information. Learning that the Archbishop had died in 1587, during a journey back to Portugal, he managed to leave Goa late in 1588 on the Santa Cruz where he found Dirck Gerritsz working as 'constable.' They arrived in the Azores on July 24, 1589, and he was obliged to spend the next two years there, negotiating with the local customs officials over a cargo of pepper that had been rescued from a wrecked ship from the fleet. During this time he composed his main works, the Reys-gheschrift and the Itinerario. Arriving back home early in September 1592, the Amsterdam publisher Cornelis Claes first published the Reys-gheschrift, in 1595; the text was then included in the larger volume published in 1596 under the title Itinerario: Voyage ofte schipvaert van Jan Huyghen van Linschoten naar Oost ofte Portugaels Indien … 1579-1592. In this volume, which was soon translated into a variety of languages, Linschoten shared the commercially sensitive information he had had access to in Goa, thereby giving Dutch (and other) merchants information on Portuguese sea-routes to the Far East. It includes a short description of Korea, the first ever published (See this link also for more about the Reys-gheschrift and the Itinerario.). 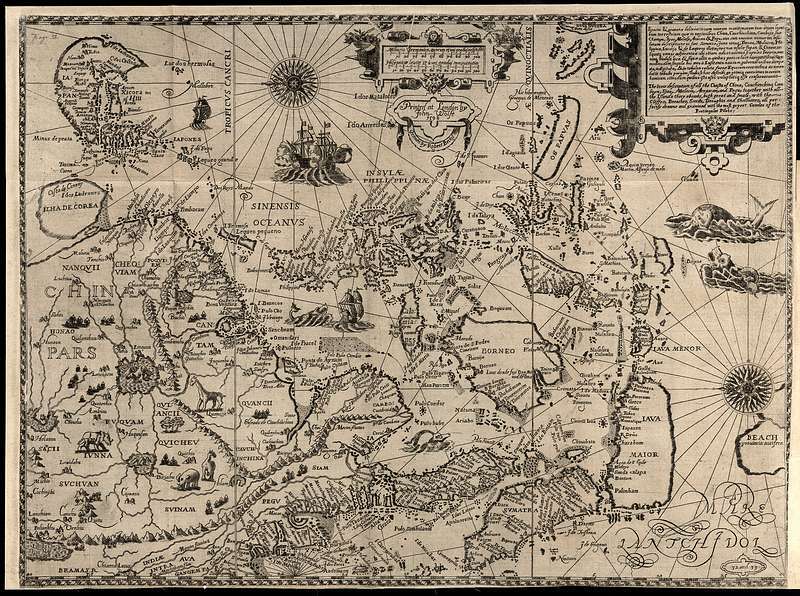 In June 1594, Linschoten sailed in the first expedition headed by Dutch cartographer Willem Barentsz, hoping to discover a route to China passing to the North of Siberia (north-east passage). He was also on the second expedition in 1595 but did not join the disastrous third, in 1596-7 when the crew had to spend the winter camping on the ice and Barentsz died. He and others published descriptions of these expeditions. It was only in 1600 that a Dutch ship first reached Japan, initiating a commercial relationship that was to last throughout the centuries of Japan’s isolation. The story of this ship, the Liefde, shows the enormous danger of travel at this time. One of the fleet under admiral Jacques Mahu that originally consisted of five ships, it arrived alone in Japan. One ship failed to pass the Straits of Magellan, one was captured by the Spanish (see above), one sank in a Pacific Ocean typhoon, and one was ‘eliminated’ by the Portuguese in Indonesia. In April 1600, after more than nineteen months at sea, the Liefde with a crew of about twenty sick and dying men (out of an initial crew of about 100) arrived at the island of Kyūshū, Japan. They made landfall on 19 April off Bungo (present-day Usuki). Among the survivors were the Liefde's captain, Jacob Quaeckernaeck, and treasurer, Melchior van Santvoort, as well as the pilot, the Englishman William Adams (1564 – 1620, see my own page). They soon met Tokugawa Ieyasu, the daimyo of Edo and future Shogun, who took a strong liking to Adams, especially. As a result, Adams became a very influential samurai, settled permanently in Japan, and helped open trade with England while the Dutch sailors, with Adams’ help, obtained permission to set up trade between Japan and the Dutch East India Company. This broke the Portuguese monopoly and the rights granted to the Dutch in 1609 were the basis for the lasting Dutch presence in Nagasaki. Adams maintained contact with England, where he had left his wife and children, and his letters to England are remarkable documents. 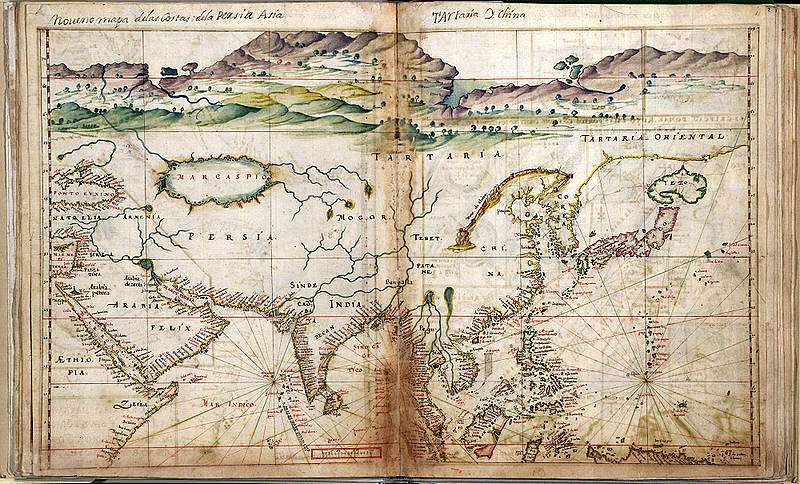 The earliest explorers of China and Japan helped cartographers to provide in commercially produced maps the first visual images of Korea, which nobody could visit or describe. The Portuguese were mainly responsible for the idea that Korea was an island, though not all maps follow that error. The texts about Korea in Hakluyt's Navigations begin by stressing that it was "esteemed at the first an iland, but since found to adjoyne with the maine not many dayes journey from Paqui (Beijing) the metropolitan citie of China." Diogo Homem (1521–1576) was a Portuguese cartographer who worked in London and Venice. 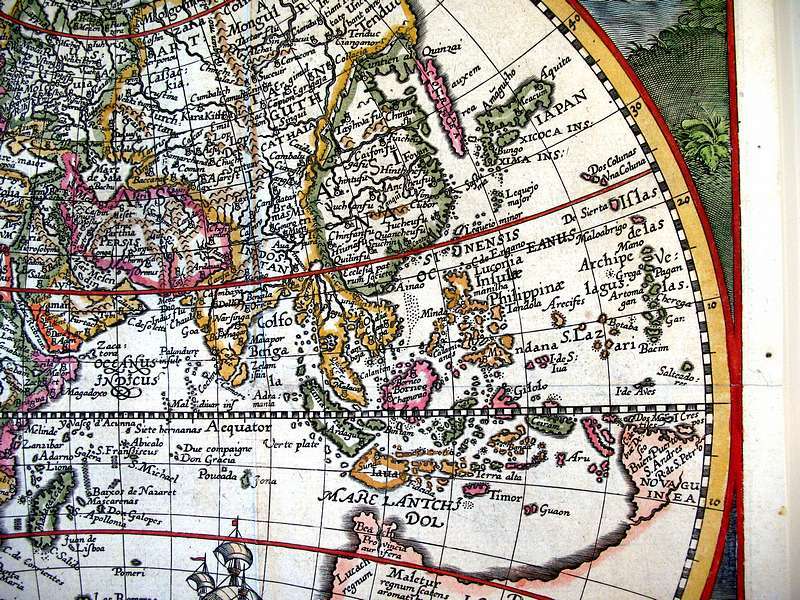 His 1554 map Lopo Homen Mapa Mundi shows Korea as a peninsula-shaped collection of islands. It is perhaps the first European map to represent Korea although it does not name it. Petrus Plancius Orbis Terrarum Typus De Integro Multis In Locis Emmendatus, auctore Petro Plancio Amsterdam, 1594. Ioannes a Duetecum iunior fecit. This was based on a map by the Portuguese cartographer Luís Teixeira, who was not quite sure if Korea was an island or not but the map shows Corea lightly joined to the continent. Hendrick Florent van Langren (fl.1574-1604) provided a map of the Far East for Linschoten's Itinerario and it gives a very different image of Island Corea (upper left), perhaps directly inspired by Linschoten's account. Soon after this, B. Langenes, Japan. Middelburg, 1598, offers a simplified version of Teixeira's map with Korea labeled "Corea Ins". One of the earliest published mentions (1596) of Korea is due to Jan Huyghen van Linschoten (1563-1611) and a separate page contains transcriptions of the English versions (1598) of his texts. Richard Hakluyt (1552-1616) was an avid collector of Spanish and Portuguese maritime materials and, using Ramusio's Navigationi et Viaggi (Volume 1, Volume 2, Volume 3) as a model, he published the first edition of his Principal Navigations in 1589. This single volume book mainly dealt with English navigational records. In 1589, Hakluyt sponsored Robert Park's translation and publication of Mendoza's Historia: The history of the great and mighty kingdom of China and the situation thereof. Subsequently in 1595, Hakluyt first introduced Linschoten's Voyages to English publishers and supported William Phillip's English translation of the work from the Dutch original. This particular work provided the English public with the first detailed information on Korea. In 1601, Hakluyt himself translated Antonio Galvao's The Discoveries of the World. In 1598, Hakluyt published the first volume of the second edition of The Principal Navigations. Volume 2 followed in 1599, and volume 3 in 1600. A complete modern edition was published in Glasgow in 1904 in 12 volumes, the descriptions of Korea are in Volume 11 of this edition. Online images of Vols 1-2 in Library of Congress ; Vol 3 in Library of Congress. [Text by Cheong Sung-Hwa] "The Jesuit missionaries in Japan were the first to provide Europe with information on Korea. Since the mid 16th century, Luis Frois, and other Jesuit missionaries stationed in Japan, regularly included information on Korea in their correspondences back home. These letters were subsequently collected and included in Richard Hakluyt's The Principall Navigations between 1598 and 1600 and in Luis de Guzman's Historia de las Missiones in 1601. At a time when materials on Korea were few and far between, these collection of letters served as an encyclopedia of sort on the region for interested European intellectuals of the time. However, in 1614, the Jesuit missionaries in Japan were expelled and Catholic missionary work was outlawed. This effectively closed that window on Korea for the Europeans. Click here for a separate page devoted to Hakluyt's predecessors, sources and texts. "Arguably the one person most instrumental in introducing China to Europe in the first half of the 17th century was the Jesuit missionary Matteo Ricci (October 6, 1552 – May 11, 1610) . . . . Ricci personally authored De Christiana Expeditione apud Sinas specifically to introduce Chinese history and culture to Europeans. Ricci's work effectively superceded Juan Gonzales de Mendoza's Historia de las cosas más notables, ritos y costumbres del gran reyno de la China (the English version published in 1588 under the title The history of the great and mighty kingdom of China and the situation thereof) as the authoritative book on China during the first half of the 17th century. Albeit to a lesser degree, Ricci's work also served as an introduction to Korea as well. [Text by Cheong Sung-Hwa] "The history of the Imjin War in Korea was made known to Europe by Alvaro Semedo, in his Imperio de la China. Born in Portugal in 1585, Semedo joined the Jesuit Order in 1602. From his arrival in China in 1613 to his death in 1658, Semedo spent some 45 years engaged in missionary work there. In 1625, Semedo travelled to Xi'an where he was able to personally peruse and later introduce to the West the recently discovered Nestorian Stele. In 1636, the Chinese Jesuit Order dispatched Semedo to Rome. Semedo was tasked with the recruitment of new Jesuit missionaries to China, procurement of funding for the mission, and most significantly, the publication of books on China. Semedo left Macao in 1637, arriving in Goa in 1637, and finally reaching Lisbon in 1640. During the long journey Semedo was able to pen the first draft of a personal account of conditions in China, later published under the title Imperio de la China. At the time Semedo embarked on his journey back to Europe, the invasion of the Manchu was in full swing, and Semedo was able to carry back valuable information on the political turmoil engulfing China at the time. The book was soon recognized as the primary source on China for Europeans. Semedo's book was published in tabloid size totalling 362 pages, and was divided into two sections. The first section, comprising approximately two thirds of the total length of the book, was composed of 31 chapters. It is devoted to introducing a variety of facets of Chinese history and culture, such as its geography, customs, language, education, literature, science, state recruitment examination system for high level officials, military weapons, form of government, prison system, court system, etc. The second section, presented in 13 chapters, delineates the history of the Jesuit mission in China, since it humble beginnings under Xavier. In Semedo's Imperio de la China, reference to Korea is limited to four topics: the Imjin Japanese Invasion of Korea, Chinese civil strife during the transitionary period between the Ming Dynasty and the Qing Dynasty, Korea's paying of tribute to China, and the introduction of ginseng." Among early accounts of Korea published in Europe, the first significant one seems to be that by Martino Martini, 1614-1661 in the Novus Atlas Sinensis of 1655. Martini had mentioned Korea several times in his accounts of the Manchu conquest of Ming China but without providing extensive information : Latin: De bello Tartarico historia, in quâ, quo pacto Tartari hac nostrâ aetate Sinicum imperium invaserint, ac ferè totum occuparint, narratur, eorumque mores breviter describuntur. Antwerp. Ex officina Plantiniana Balthasaris Moreti, 1654 French: Histoire de la gverre des Tartares, contre la Chine. Contenant les revolvtions estranges qui sont arriuées dans ce grand royaume, depuis quarante ans. Paris, I. Henavlt, 1654. English: Bellum Tartaricum, or The conquest of the great and most renowned empire of China, by the invasion of the Tartars, who in these last seven years, have wholy subdued that vast empire. Together with a map of the provinces, and chief cities of the countries, for the better understanding of the story. London, : Printed for John Crook, and are to be sold at his shop at the sign of the Ship in St. Paul's Church-yard., 1654. (Bibliography) The following year,1655, the English text of Martini's Bellum Tartaricum was republished in a volume that began with Alvaro Semedo (1585-1658, see above) The history of that great and renowned monarchy of China. Wherein all the particular provinces are accurately described: as also the dispositions, manners, learning, lawes, militia, government, and religion of the people. Together with the traffick and commodities of that countrey (1655). (see Cheong Sung-Hwa). Martini's text of the Bellum Tartaricum begins on page 251; he does not give an extended account of Korea in this work. The maps in this volume were those first published in 1625 by Samuel Purchas in his Haklvytvs posthumus, or, Pvrchas his Pilgrimes. Martini's De bello Tartarico historia was followed by his Novus Atlas Sinensis, which was published as part (Volume 6) of Joan Blaeu's Atlas Maior (Amsterdam 1655). It contained maps of China in general and all the provinces as well as a map of Korea and Japan. The Latin texts describing these lands, and the final account of the Tartar wars is not available online or in English. For a summary of Martini's mentions of Korea see Cheong Sung-Hwa's pages and here is an English version of the account of Korean culture etc by Martini from the Atlas (1655). 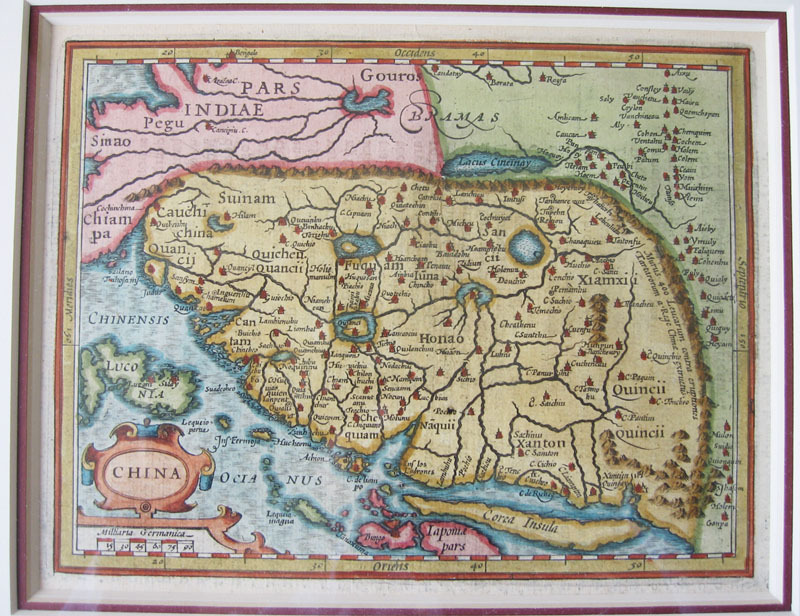 Blaeu China Veteribus Sinarum Regio. 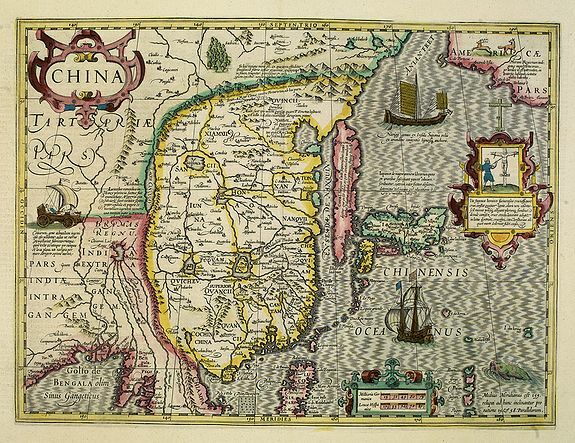 also showed Corea as an island in 1638, the 1655 map shows many corrections due to Martini. Johan Nieuhof (see Wikipedia: born Uelsen, 22 July 1618 - Madagascar, 8 October 1672) was a Dutch traveler who wrote about his journeys to Brazil, China and India. The most famous of these was a trip of 2,400 km from Canton to Peking in 1655-1657, which enabled him to become an authoritative Western writer on China. At his homecoming in 1658, he had entrusted his notes and annotations to his brother Hendrik, whom Johan thanked when finally (in 1665) Hendrik produced an ample study of China, with many images, text and explanation of the latest events. Hendrik dedicated the work to Hendrik Spiegel and Cornelis Jan Witsen (Nicolaes Witsen's father), administrators of the East and West India Companies respectively. The Dutch version : Het Gezandtschap der Neêrlandtsche Oost-Indische Compagnie, aan den grooten Tartarischen Cham, den tegenwoordigen Keizer van China (1st edition: Amsterdam : Jacob van Meurs, 1665) Translations into French (1665), German (1666), Latin (1668) were also published, each going into at least two editions. The English version was first published in 1669: Nieuhof, Johannes, 1618-1672 : An embassy from the East-India Company of the United Provinces, to the Grand Tartar Cham, emperor of China: delivered by their excellencies Peter de Goyer and Jacob de Keyzer, at his imperial city of Peking wherein the cities, towns, villages, ports, rivers, &c. in their passages from Canton to Peking are ingeniously described by John Nieuhoff; also an epistle of Father John Adams, their antagonist, concerning the whole negotiation; with an appendix of several remarks taken out of Father Athanasius Kircher; Englished and set forth with their several sculptures by John Ogilby Esq; His Majety’s Cosmographer, Geographick Printer, and Master of the Revels in the Kingdom of Ireland, The second edition, London, printed by the Author in his house in White-Friers, M.DC. LXXIII. (1673) (the first edition was: London : Printed by J. Macock for the author, 1669). There is also online a set of pages with the original Dutch and a modern English translation of the original Dutch text about Korea by Henny Savenije. There is a single page in Nieuhof devoted to a description of Corea (the 1673 English version is available here) and it is remarkably (suspiciously) similar to the account given by Martini. The first extended account of Korea based on personal experience is that by Hamel. Hendrick Hamel was one of the crew members of the Sperwer. Shipwrecked, he lived in Korea 1653-1666. After escaping he wrote an account of his adventures and a description of Korea that has survived in manuscript. It was published in 1668 in Rotterdam with the title; Journal van de Ongeluckige Voyage van 't Jacht de Sperwer (The journal of the unfortunate voyage of the jaght the Sperwer). This was soon translated into French and published as : Relation du noufrage d'un vaiseau hollandois sur la Coste de l'Isle de Quelparts. Avec la Description de Royaume de Corée. Traduit de Flamande, par Monsieur Minutoli. A Paris, chez Thomas Jolly, au Palis, dans la Salle des Merciers, au coin de la Gallerie des prissonniers, la Palme & aux Armes d'Hollande. (1670). This was translated into English by John Churchill and published in 1704 as part (starting page 607) of the 4th volume of his A Collection of voyages and travels with the title An Account of the Shipwreck of a Dutch Vessel on the Isle of Quelpaert (this links to the Archive version of a microfiched 1732 edition. Click here for the 1704 edition) : some now first printed from original manuscripts, others now first published in English : in six volumes with a general preface giving an account of the progress of navigation from its first beginning. A modern English translation made from the original manuscript is available from the Royal Asiatic Society Korea Branch, Seoul. In 1705 Nicolaas Witsen published a second edition of his Noord en Oost Tartarye, ofte bondig ontwerp van eenige dier landen en volken, welke voormaels bekent zijn geweest (2 volumes, Amsterdam: Halma 1705) which included an account of Korea by one of Hamel's companions, the surgeon Mattheus Eibokken of Enckhuijsen (= Enkhuizen), and a list of Korean words provided by Eibokken with their Dutch equivalent, the first such list published in the West. The book was little read however, and was never translated, so that the word list was only noticed and commented on in recent years. Witsen's book also contains other information about Korea, starting on page 46 of Volume One, and this includes (page 48-49) a Dutch description of a Korean embassy to Japan in 1636-7 (see English translation). From page 50 he quotes a description of Korea from the description of Japan by Arnoldus Montanus (see above). For the 18th century, click here.